The Foreign & Commonwealth Office (FCO) has praised Excel London for its role in hosting the G20 London Summit. FCO assistant director Tony Humphries said: "The team at ExceL London offered us outstanding support throughout the initial planning process, right through to the effective delivery of this event. The venue's flexible nature was exactly what we needed, allowing us to adapt the event format at short notice." Some 4,000 delegates attended the event. 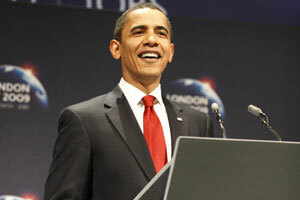 The event brought together 20 heads of states including US President Barak Obama, President Nicolas Sarkozy of France, Chinese President Hu Jintao, Brazilian President Luiz Inacio Lula da Silva, King Abdullah Bin Abdul Aziz of Saudi Arabia, German Chancellor Angela Merkel and UK Prime Minister Gordon Brown.